The Cambridge Cameo is a revision of the older classic Cameo. The original Cameo, which began production in the 1920s, had been unavailable for a while. Due to popular demand it was recently reissued. The main differences from the other models are the cover and gilt edges. 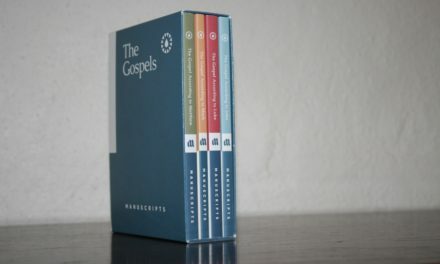 The calfsplit model includes the Apocrypha. The Cameo uses a semi-bold Petit Medieval Clarendon 8-point font. The type is bold enough to read easily. It has pronunciation marks to help you pronounce names and places. The font is the same size as the Concord Wide-margin. For the size of this Bible I did not expect the type to be this large or this easy to read. My 40+ year-old eyes had no problems reading the Cameo text. They really mean it. This red letter is really ‘red’. I like it. 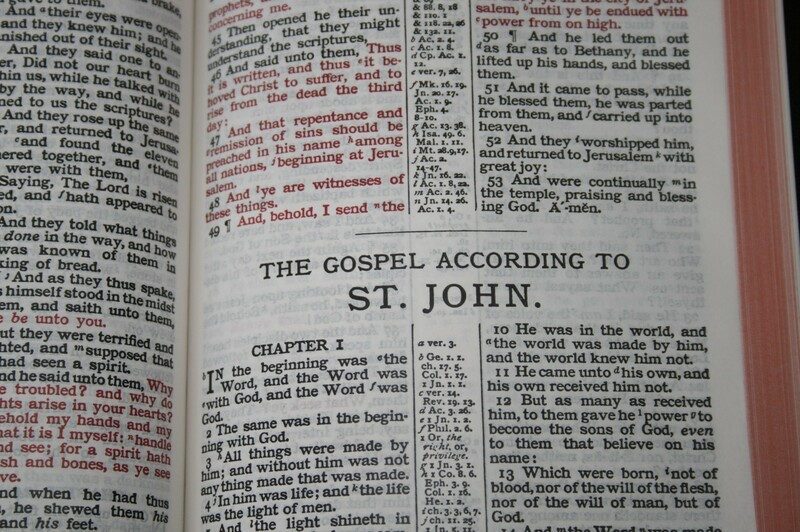 Only the words of Christ on Earth are in red, so the red letter stops after Acts chapter 1. I prefer red-letter to continue through Revelation, but it isn’t a deal-breaker. The red-letter is about the nicest I’ve seen. The Cameo uses an opaque India paper. The paper is not too thin like most of the study Bibles in my library. The ghosting from the other side of the page is very faint, which is much better than I had hoped. In a Bible this small I didn’t expect to see that many references, but this Bible doesn’t skimp at all. There is a center column reference that also includes Hebrew and Greek translation notes. I like translation notes in KJV Bibles and I’m really glad to see the notes in the Cameo. In a Bible this size I didn’t expect to see a concordance at all, let alone a concordance this vast. It has 137 pages. 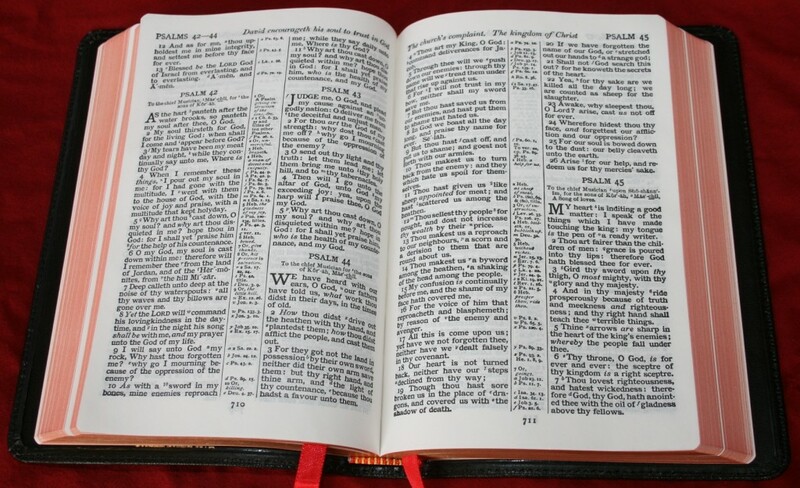 The concordance is the same concordance in the Cambridge KJV Concord Wide Margin. The binding is sewn. 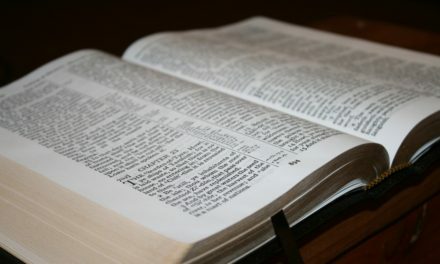 This allows the Bible to stay open and lay flat. This model is goatskin, but it also comes in brown calfskin, calfsplit, and imitation leather. The goatskin is very soft and feels good to the touch. It’s very flexible. I was able to twist and contort it with no problems at all. For those that like flexible covers, the goatskin delivers. I’m sure all of the covers are nice, but I really like the goatskin. 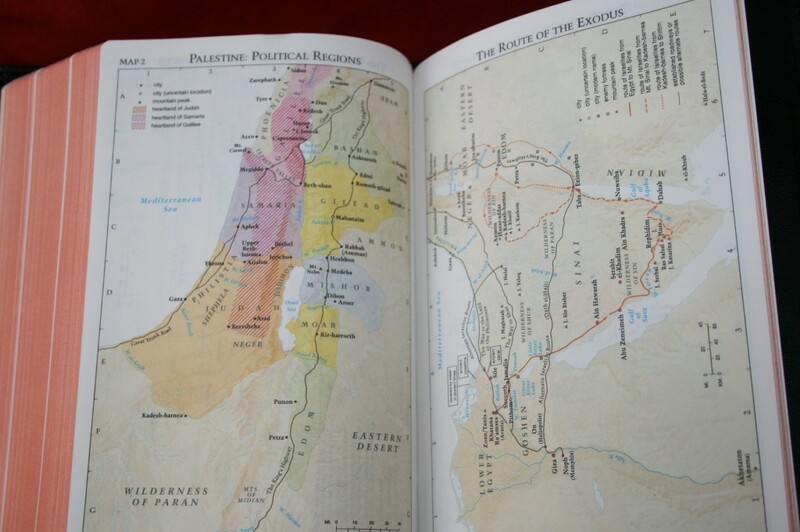 The Cameo has the same 15 maps as the Concord Wide-margin. There is also a nice index to the maps, making it easy to find what you’re looking for. The Cameo has an amazing guarantee. Like all Cambridge Bibles, the Cameo is unconditionally guaranteed for life against defective materials or workmanship of any kind. With quality of this caliber, the Cameo is sure to last a life-time. I am thoroughly wowed by the Cameo. This is a fine ‘carry with me’ reading Bible. It excels at being easy to carry and handle, and the text doesn’t suffer from its size. It’s the perfect blend of small size, readable text, and high quality. For its size and weight I can’t imagine a better Bible. The Cambridge Cameo is one of the best made Bibles I’ve seen. I can’t find anything that I would like to see changed in the Cameo. The Cambridge Cameo is back and it means to please. I am not a seasoned writer but I can’t say how much I appreicate that you covered every point. Every question I had was answered and I have read numerous reviews. The one question I could not get answered was does the goatskin lay flat. The verbiage and the pictures helped a great deal. I saw the fake leather one at the store and fell in love with it but prefer leather. 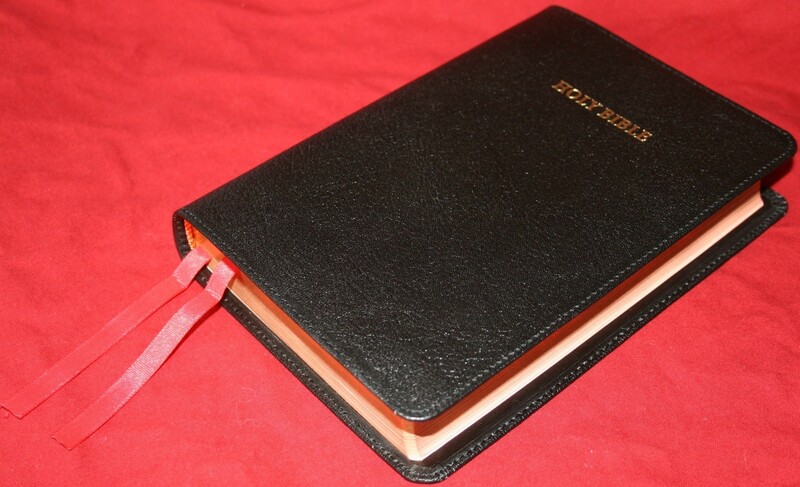 I travel a lot and have spent so much on many bibles none had every feature I was looking for. This one finally fits the bill. Large print, thin line and compact with reference. I will be getting my goatskin thanks to this detailed review. Not sure how you can say “it’s even better than before”. I’ve owned modern Cameos and vintage Cameos. The difference between old and new is night and day. The quality of the Cameos from the 50’s through the early 80’s is far superior in every way. Just curious if you own a vintage one, or if you’re just making an uninformed statement. Hi Rod. Not an “uninformed” statement. I own several vintage Bibles and they’re all higher quality than you can get today of the same Bible. I’ve seen plenty of vintage Cambridge Bibles and they’re all high quality. I wasn’t comparing this to vintage. The Cambridge line in recent years (not early 80’s) have had a lot a bad press for low quality. This Cameo is of higher quality than the modern production run before it. I should have mentioned that in the review, but I didn’t want the focus to be on a bad quality run. You said you’ve owned modern Cameos. Do you own this Cameo, or do you own the one I’m saying this is better than? 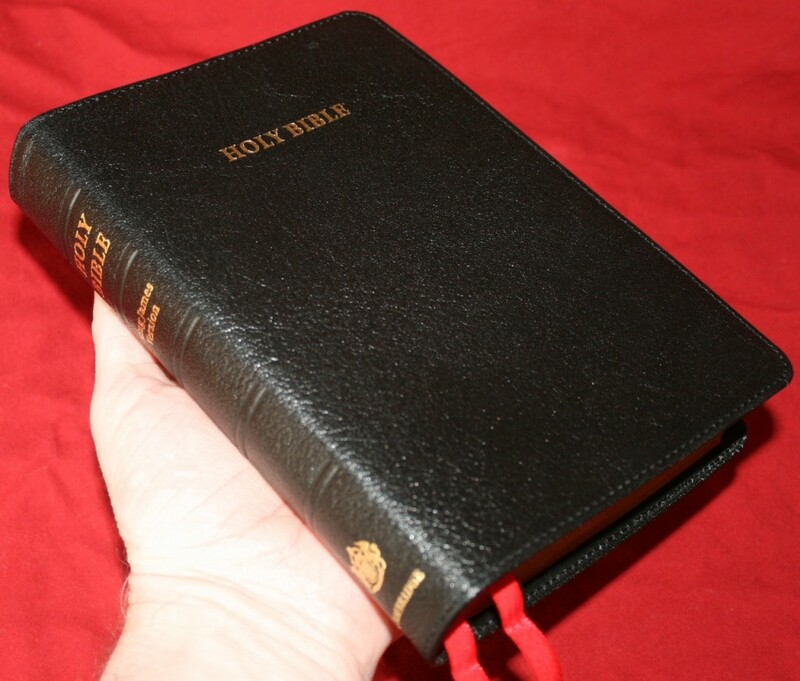 If you had a choice between a CBP compact center column , goatskin cameo kjv, RL allan blackface highland goatskin kjv or a RL allan highland goatskin 5c brevier Claradon kjv which would you choose? 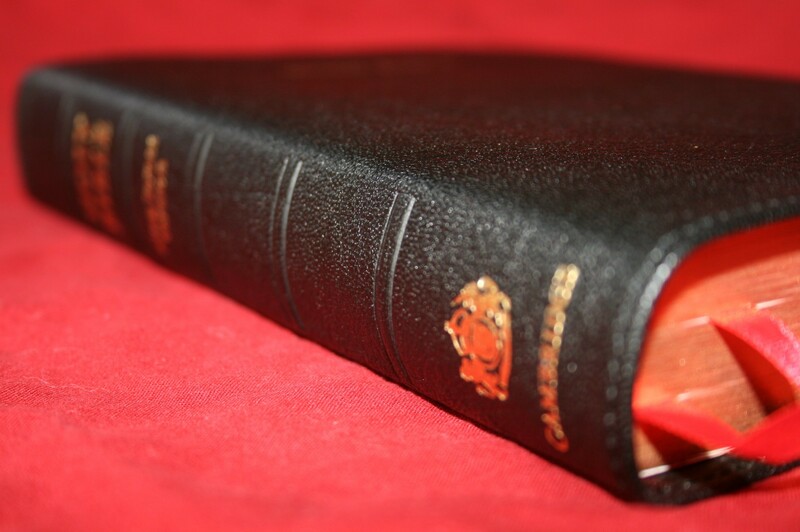 CBP Compact Center Column – I don’t have this Bible but I do have the Cambridge Personal Concord which this is a reprint of. It has a highly readable font with no cross reference or footnote keys in the text, and the text never feels cramped. If it includes the glossary and dictionary then it has the most information in it than any Bible on this list. The font is small and if the paper is anything like other Bibles from CBP and LCBP it might has a slight glare under certain lighting. Cameo KJV – this has an excellent overall size and font size ratio. I love the print quality and paper. I love this one for carry and reading and is the Bible I use the most from this list. The text can feel a little crowded in some places. Allan Blackface – I’ve never seen this one, but I do have the old Oxford which is slightly larger than a Cameo or Clarendon. It has a nice font. It has a lot more self-pronunciation marks than the others on this list. I don’t know what paper is used in the Allan. Allan Brevier Clarendon – This has about the same font and layout as the Cameo. It has a cyclopedic concordance with a lot of good material for study in the back. The size is about the same as the Cameo but the paper is thinner and has more show-through. If I had to choose I would have to think about how I was going to use it and what other tools I had. All four are great choices. I lean toward the better quality paper but I don’t know the quality of two on this list. Of the two I do know the quality of I lean toward the Cameo over the Brevier Clarendon, but only for readability. If I need tools, the BC is a better choice than the Cameo. Between my Cambridge Personal Concord, Cambridge Cameo, Oxford Blackface, and Allan Brevier Clarendon, I personally use the Cameo the most. At least at this point in time. Nice! Thanks for sharing. I’m glad they’ve upgraded. Now I want the newest edition (mine was made before Indopaque was available).